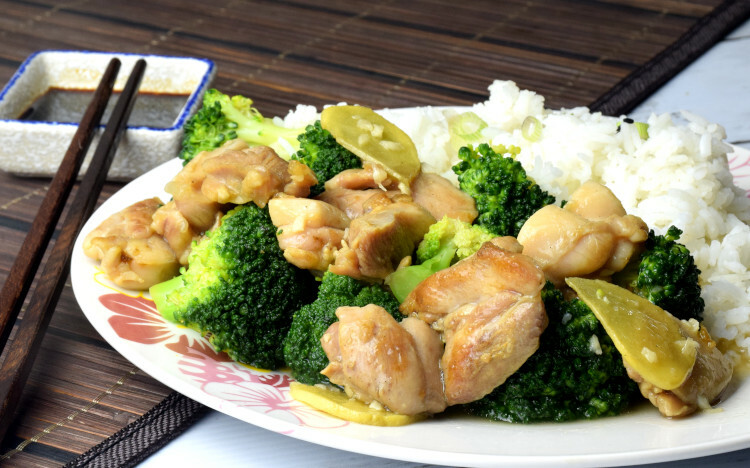 Chicken and broccoli stir-fry is a breeze to prepare, all within half an hour or less. It is the perfect dish when you are running out of time in the kitchen or have a sudden craving for the Chinese take-out. There are many similar recipes on the internet. But I want to publish mine because it is the one that is popular among the Chinese community in Malaysia, and I am feeling proud to share it with everyone. My parents are originated from Hong Kong, in which I still make a few trips in a year to visit my family there. So you will expect that my chicken and broccoli stir-fry has a strong influence of the Cantonese style cooking. Instead of merely bragging about how tasty it is, I would make an effort to point out a few tips that will make sure you get the best stir-fry dishes that you wanted. Read on to get the tips! Marinate the chicken meat to make it flavorful. Half froze the chicken breast so that it is easiest to cut into thin slices. Blanch the broccoli first before stir-frying. Brown the chicken pieces for better flavor. Use plenty of garlic and ginger. Stir-fry over high heat before dish out. Chicken breast or chicken thigh meat? 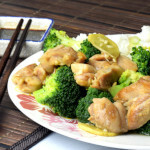 Chicken breast is the favorite meat for stir-frying in the west, but Asian generally preferred the juiciness and texture of chicken thigh meat. You néed to cut the chicken meat thinly so that it is quick to cook during stir-frying. 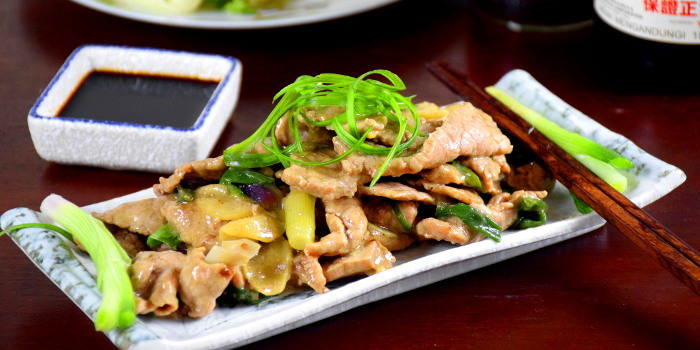 Thin slices are more tender after stir-frying, especially for chicken breast meat. To do this, freeze the chicken meat until half frozen. It is easier to cut the half-frozen state as it is firm enough to handle easily. You should be able to slice it as thin as you can. Always cut the meat across the grain. This method is useful especially if you substitute it with beef. It may not be so critical for a stew that involves prolonged cooking. Cutting across the grain will make every bite easy to chew through. Why do we need to marinate the chicken? The chicken slices are thin. The stir-fry sauce is savory. So why do we need to marinate the chicken? The flavor of the sauce will only coat on the surface while cooking. You will expect a different mouthfeel if you eat a piece of marinated meat. The salt from the marinade will penetrate deep into the chicken. In other words, the flavor is only skin deep if you opt not to marinate the meat. Here is the simple marinade for this recipe, and works for most the other recipes too. For 100g of chicken, marinate with one tsp of light soy sauce, one tsp of oil, 1/8 tsp of salt and 1/4 of egg white. An easy way to cut the broccoli into florets. Cut the broccoli into larger florets looks more presentable than smaller florets, in my opinion. Cut the stalk away as close to the florets as possible. Some of the florets will fall off themselves. Snap off the remaining florets with your hand. Cut the stalk once more so that the remaining florets will either detach themselves of able to be snapped off. The broccoli florets will not look good if you use the knife to cut a large one into two. Do not throw away the stalk. Cut away any fiber part of the stalk and slice them thinly. Broccoli stalk is crispy and tender. 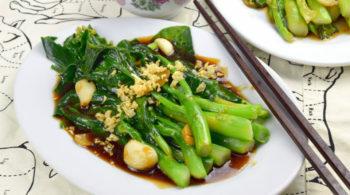 You can try the other related recipe Chinese broccoli which I posted earlier for a change if you like broccoli. 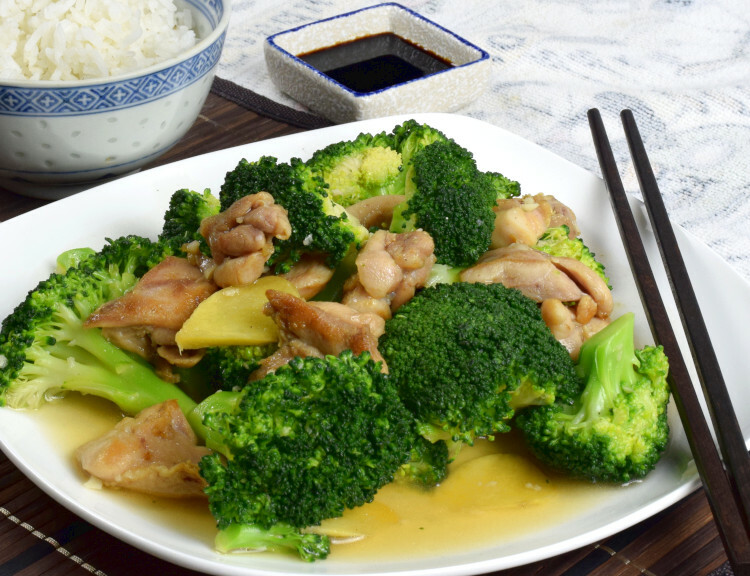 There are two ways to stir-fry the broccoli, either stir-frying it until it turns soft or blanches it in advance. My favorite method of preparing this dish is to blanch it before stir-frying. The advantage of the second method is the stir-frying time is cut to just half a minute. The florets will have a better appearance. 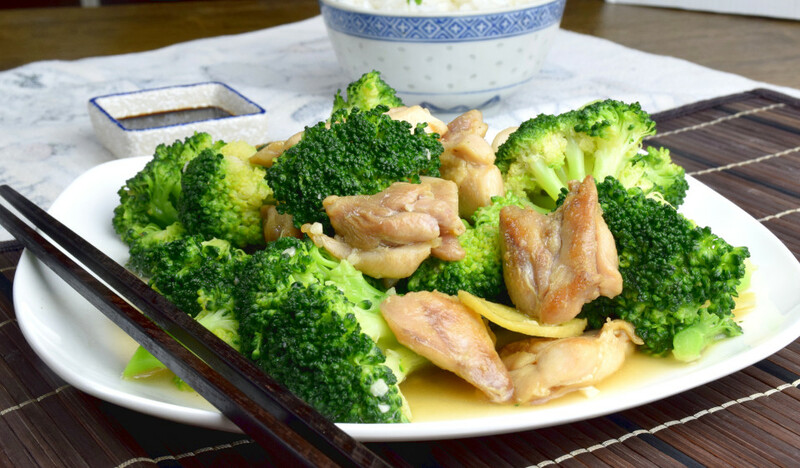 If you do not blanch the broccoli, you need about two to three minutes to stir-fry the broccoli until it turns soft, the broccoli will lose its bright color at the end. Blanching with plenty of water produce broccoli that is crisp and clean. I set my kitchen timer for two minutes for the florets and two and a half minutes for the stalk slices. Start to blanch the broccoli when it is fully boiled. The amount of water should be at least three times the volume of the vegetables. It should be about almost cook, which will finish with a short burst of high heat during stir-frying. Once it is done, remove it immediately and soak it in a pot of ice water. The cold water will immediately stop the cooking process of the vegetable. Shock the broccoli with cold water has an additional advantage. You can drain the vegetable and keep it refrigerated for a day without losing its crispness and the vibrant color. That means you can prepare it in advance. The sauce to stir-fry the chicken is another critical element of this recipe. I use the standard seasoning items for formulating the sauce – light soy sauce, oyster sauce, sugar, salt, cornstarch, and sesame oil. I want to keep it simple as I do not want it to overpower the natural flavor of the broccoli. Since the chicken slices are marinated, you do not need to worry that it does not have enough flavor. A drizzle (about 1/4 teaspoon) of sesame oil. Most of the recipes suggest making a cornstarch slurry to thicken the sauce. The general guideline is to combine one part of cornstarch with two parts of water to make a slurry and add to the stir-fried vegetables or meat at the final stage of cooking. In this recipe, I have incorporated the cornstarch slurry into the sauce. This method is developed over time when I work in the restaurant and realized that this is the best way to ensure every staff will thicken the sauce to the same consistency. You can use the regular flour instead of cornstarch. Since the thickening power of the regular flour is less than cornstarch, you have to use three times the amount of cornstarch to achieve the same consistency. Furthermore, it is not as stable as cornstarch, which means the thickness of the sauce will reduce overtime. If you notice the stir-fry sauce of certain dishes on the dining table become thinner gradually over time, there is a high chance that it is thickened with regular flour. I do not use dark soy sauce as the seasoning as it will darken the bright color of the broccoli. Stir-fry the chicken with some oil. Once it turns color, let the heat of the wok to brown the chicken pieces. Now you have the seasoned chicken which is full of wok aroma. Next, clean the wok before stir-frying the broccoli with the sauce. The debris of chicken and some burned garlic will stick onto the broccoli florets if you do not do so. It will not affect the taste, but it does not look good. However, if you do not mind that, deglaze with the stir-fry sauce and you will capture all the flavor. You can choose either way you like. Add some oil into a clean wok, saute the garlic with some oil. Add four slices of ginger and stir-fry together. Ginger works best for this recipe. If you want to substitute the chicken with beef, double the amount of ginger slices in this recipe. Ginger works exceptionally well with beef. When the garlic starts to turn golden brown, pour the stir-frying sauce into the wok. Cook over low heat while keep stirring with the wok spatula until the sauce become transparent, that is when the cornstarch is cooked. Combine the broccoli with the sauce in the wok. Let the broccoli absorb the flavor of the sauce. Stir-frying over a tower of inferno is the signature showmanship of the Chinese chefs. Return the chicken to the wok. Turn to high heat and stir-fry for a short while, about twenty seconds. Keep flipping and stirring the morsel of food so that they all touch the burning hot surface of the wok in a split of second and immediately tossed back to the air. This action is the essence of stir-frying, and the secret of generating the familiar wok aroma. Do not overdo this step as the sauce might all dry up and the stir-fry is no longer saucy. If you like, add a tablespoon of Shaoxing wine to boost up the flavor. Add some sesame oil to the wok, give it a quick stir and dish up. Sesame oil is not stable over high heat. That is why I recommend to add only at the last step of the cooking. Cast iron wok is best for stir-frying. A well-seasoned wok is nonstick even over high heat. It also has a high heat capacity, which means that the wok remains hot even after removing from the stove. This property is ideal for stir-frying. Stainless steel wok is the next best thing. It is almost as good as the cast iron wok (we use it our kitchen). The only disadvantage is that the non-stick coating created after seasoning the wok will wear off quickly, which needs to re-seasoned the wok more often. Choose the right oil for stir-frying. Most of the Asian are using either peanut oil, corn oil and palm oil for stir-frying. These oils have a high smoking point, which means they can withstand high heat during stir-frying without worrying of breaking down. I use palm oil for stir-frying, and corn oil occasionally. Olive oil is not for stir-frying if you want to follow how the Asian cooks. Since it has a relatively low smoking point, you will not be able to stir-fry over high heat as olive oil will turn into smoke. A simple but tasty quick dish best to be served with rice. Cut the chicken meat into bite size. Marinate with (A) for 15 minutes. Blanch the broccoli florets for two minutes and two and a half minutes for the stalks. Place in ice water to cool. Drain. Stir-fry the chicken with some oil. Once it turns color, let the heat of the wok to brown the chicken pieces. Set aside. Add some oil in a clean wok, saute the garlic and ginger with some oil. When the garlic starts to turn golden brown, pour (B) into the wok. Cook over low heat until the sauce becomes transparent. Combine the broccoli with the sauce in the wok. Return the chicken to the wok. Turn to high heat and stir-fry for a short while, about twenty seconds. Add a tablespoon of Shaoxing wine. Add the sesame oil to the wok, give it a quick stir and dish up. 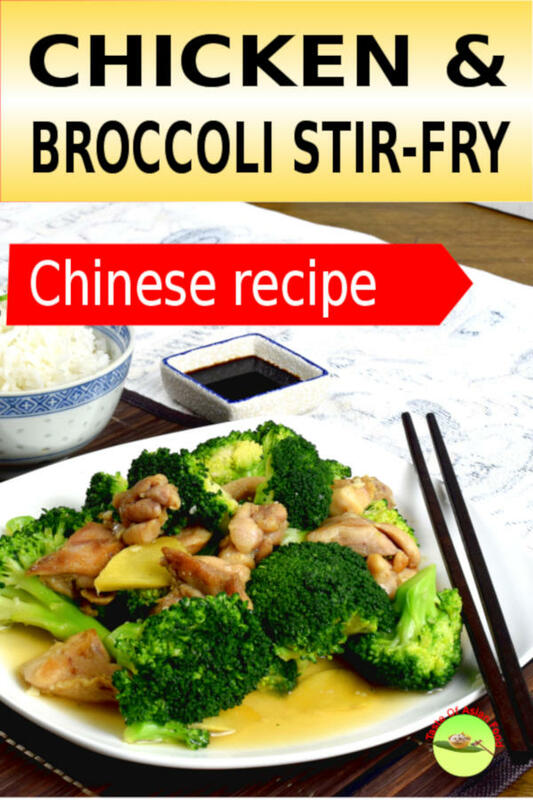 12 replies to "Chicken and broccoli stir-fry recipe (in 4 simple steps)"
Lately I am unable to view the recipe emails on my Samsung S8+ mobile phone using the default email app. Had even changed the email download size to unlimited but still the same issue. Am able to view your email on my laptop with Chrome. Please advise if there are any changes to viewing it from the mobile versus from a laptop, or do I need to tweak anything further on my mobile phone. This happening is likely beyond my knowledge of cooking. I am using an Android phone (not Samsung) and be able to open it without any issue. I tried with another Samsung A5 to open and it does not have a problem too. Will this is caused by the setting of the phone? Why are you marinating the meat in egg white? What is the different between using egg white vs whole egg? I saw that it is very common to marinate the meat in soy sauce, shaoxing wine and cornflour, why do you add the wine at the end? 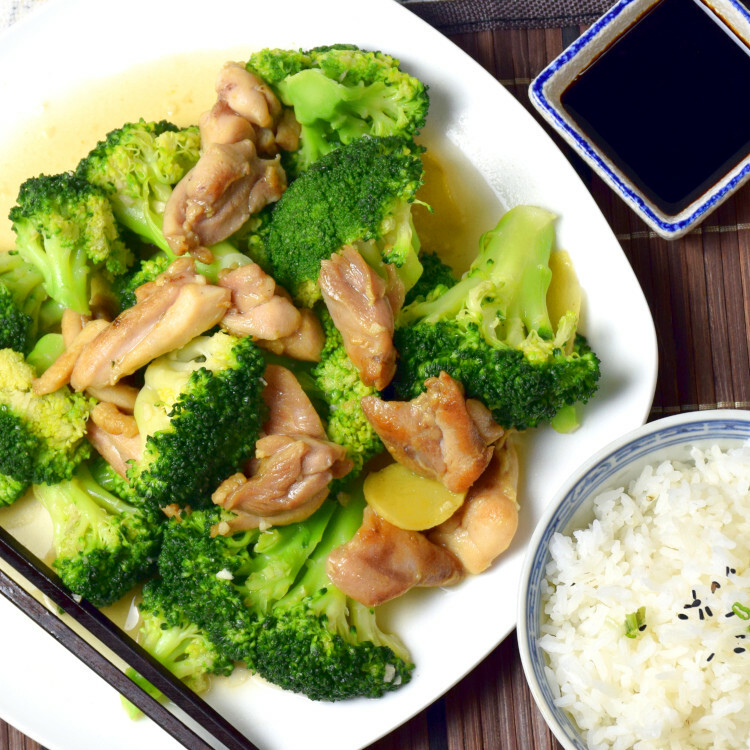 Thanks so much for your question about the chicken and broccoli stir-fry recipe, which I assume many readers would like to know the reason why I do so. Egg white will form a layer on top of the chicken. It helps to protect the direct heat from the wok (or hot oil when deep fried) from contact the surface. Hence, it helps to prevent the meat from drying too fast and become dry. In short, it helps to make the meat more tender and smooth. I have not tried to use the whole egg before, so I can’t tell what the outcome is. I omit the cornflour from the marinade as cornflour will cause the chicken pieces to stick to the surface of the wok (or pan). If you use cornflour to marinate, I suggest you can deep-fry the chicken in the deep-frier. I add the wine at last as prolonged cooking will destroy the flavor. I prefer I can taste the flavor of the wine. So glad to know that the chicken and broccoli stir-fry recipe works. Please change whatever deem necessary to suit your tastebuds. Cheers! Thank you for this lovely recipe. I wanted to know if there is a substitute to oyester sauce in Chinese cooking as I don’t eat seafood. Kinldy do revert on this as I am really keen on cooking this dish. There is vegetarian oyster sauce as the substitute. It is made with mushroom extract but tastes very close to an oyster sauce. Try any local Asian grocery sauce and ask for Vegetarian oyster sauce. The brand Lee Kum Kee produce this sauce. You can also order from Amazon online. Thankyou sir for your reply. In context of Chinese cooking I want to understand that in absense of oyster sauce (veg or non veg) what gives authentic restaurant style taste to a chinese stir fry. I am sure oyster sauce is a modern day invention and there must be some substitute or replacement that gives an authentic delicious taste to a Chinese stir fry dish and is as delicious. I have always searched for this answer but never found an answer till now. Hope you are able to help me with an answer. You can use the vegetarian oyster sauce as the substitute. It’s made with mushroom extract but taste like oyster sauce. Please ask from your local Asian grocery shop. The brand Lee Kum Kee produce it, or you can get it from Amazon online.